Engines have been powering our world since the Industrial Revolution: first, dirty coal-powered steam engines, then cleaner and more efficient gasoline engines, and more recently jet engines in airplanes. The basic concept of an engine—something that exploits the difference between a high temperature and a low one—hasn't changed in a couple of hundred years, although occasionally people do still come up with minor improvements that make the process slightly faster or more efficient. One engine you may have heard a lot about recently is the Stirling Engine, which is a little bit like a steam engine that uses no steam! Instead, it heats, cools, and recycles the same air or gas over and over again to produce useful power that can drive a machine. Teamed up with solar power and other new technologies, Stirling engines sound like cutting-edge technology, but they've actually been around since 1816. Let's take a closer look at how they work! 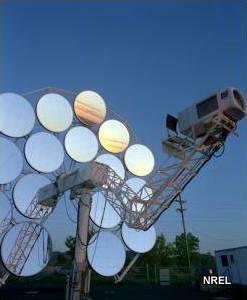 Photo: Stirling engines are becoming increasing popular for harnessing renewable energy. In this photo, you can see an array of mirrors concentrating the Sun's heat onto a Stirling engine that generates electricity. The Stirling engine is mounted on the arm on the extreme right. Photo by Warren Gretz courtesy of US DOE/NREL (US Department of Energy/National Renewable Energy Laboratory). Engines that drive vehicles or factory machines are examples of what scientists call heat engines. They burn an energy-rich fuel (coal, gasoline, or something else) to release heat energy, which is used to make a gas expand and cool, push a piston, turn a wheel, and drive the machine. Engines come in two basic types: external combustion engines (for example, steam engines) burn the fuel in one place and produce the power in another part of the same machine; internal combustion engines (such as car engines) burn the fuel and make the power in exactly the same place (in a car, it all happens in the super-strong metal cylinders). Both types of engines rely on heat energy making a gas expand and then cool down. The greater the temperature difference (between the gas at its hottest and its coldest), the better the engine works. The theory of how an engine works is based on the science of thermodynamics (literally, "how heat moves") and on a theoretical model of how ideal engines expand, contract, heat, and cool a gas in a series of steps called a cycle. Before we can discover what's so good about Stirling engines, it helps if we know what's so bad about steam engines. How do they work? You have a coal fire that heats water until it boils and makes steam. The steam travels down a pipe to a cylinder, through an open, entry valve, where it pushes a piston and drives a wheel. The entry valve then closes and an exit valve opens. The momentum of the wheel makes the piston return into the cylinder, where it pushes the cooled, unwanted steam out through the exit and away up the smokestack (chimney). Photo: Steam engines, such as the one in this locomotive, are examples of external combustion engines. The fire that provides the energy by combustion (1) is outside (external to) the cylinder where heat energy is turned into mechanical power (3). In between the two, there's a boiler (2) that turns the heat energy into steam. 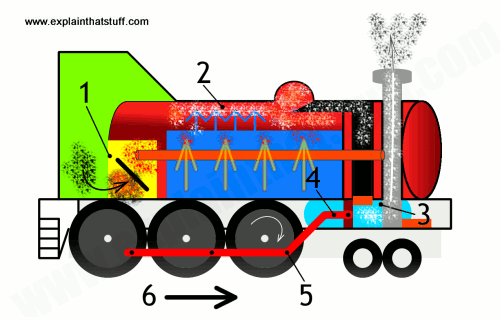 The steam acts as a heat-transporting fluid, pushing a piston (4) that moves the wheels with a crank (5) and propels the train (6). Steam and heat energy are constantly being ejected from the smokestack (7), making this a particularly inefficient and inconvenient way to power a moving machine. But it was fine in the days when coal was plentiful and no-one much cared about damaging the planet. Can we design an engine that overcomes these problems? Suppose we get rid of the boiler (which would solve the risk of explosions) and use the heat from the fire to power the engine directly. Then, instead of using steam to move heat energy from the fire to the cylinder, why not put the cylinder nearer to the fire and use ordinary air (or some other simple gas) to move the heat energy between them? If we seal this air in a closed pipe, so the same air moves back and forth over and over again, picking up energy from the fire and releasing it in the cylinder, we solve the problem of the engine needing a constant supply of water. Finally, why not add some sort of heat exchanger so that as the hot air passes back and forth, it's energy is retained inside the machine and recycled to improve the overall efficiency. These are the essential ways in which a Stirling engine improves on a steam engine. You'll sometimes see Stirling engines described as "closed-cycle, regenerative heat engines," which is a very terse way of saying what we just said: closed-cycle means they use a sealed volume of gas to move heat back and forth, over and over again, through a series of endlessly repeated steps; regenerative simply means that they use heat exchangers to retain some of the heat that would otherwise be lost on each cycle (blown uselessly up the smokestack, as it is in a steam engine). Some people say Stirling engines are simple. If that's true, it's true in the same way that the great equations of physics (like E = mc2) are simple: they're simple on the surface, but richer, more complex, and potentially very confusing indeed until you really figure them out. I think it's safer to think of Stirling engines as complex: lots of very poor videos on YouTube show how easy it is to "explain" them in a very incomplete and unsatisfactory way. To my mind, you can't understand a Stirling engine simply by building one or watching one operating from the outside: you need to think hard about the cycle of steps it's going through, what's going on with the gas inside, and how that differs from what happens in an ordinary steam engine. Anyway, let's see if we can explain the Stirling engine properly, first by looking at the parts it contains, then thinking about what they do, and finally looking at a bit of the more complex (thermodynamic) theory. Photo: Small, compact displacement Stirling engines like this one can run from tiny heat differences—even by resting on someone's hands and running off the heat they contain. Photo courtesy of NASA Glenn Research Center. What are the key parts of a Stirling engine? The heat source is where the engine gets all its energy from and it could be anything from a coal fire to a solar mirror concentrating the heat of the Sun (as in our top photo). Although described as external combustion engines, Stirling engines don't have to use combustion (actual burning of fuel) at all: they simply need a difference in temperature between the heat source (where the energy comes from) and the heat sink (where it ends up). You can drive a small Stirling engine with the heat from a cup of coffee, the warm palm of someone's hand, or even (to many people's complete astonishment) with an ice cube: the energy the engine puts out comes from any difference in temperature between the heat source and the heat sink. Having said that, it's worth remembering that there's only so much work you can do with a tiny Stirling engine powered by something like a cup of coffee, simply because it contains only a relatively small amount of energy, which is very quickly used up. Artwork: The main parts of a displacer Stirling engine. There's a volume of gas permanently sealed inside the machine in a closed cylinder. It can be ordinary air, hydrogen, helium, or some other readily available substance that remains a gas as it's heated and cooled through the engine's complete cycle (the repeated series of operations it goes through). Its only purpose is to move heat energy from the heat source to the heat sink, powering the piston that drives the machine, and then to go back again to pick up some more. The gas that moves heat is sometimes called the working fluid. The place where the hot gas is cooled before being returned to the heat source. This is typically some sort of radiator (a piece of metal with fins attached), which expels waste heat to the atmosphere. There are various different types of Stirling engines, but I believe all of them have two pistons—that's one of the more obvious things that differentiates them from other engines. In a common design called a two-piston (or alpha) Stirling engine, there are two identical pistons and cylinders and the gas shuttles back and forth between them, heating and expanding, then cooling and compressing, before the cycle repeats. 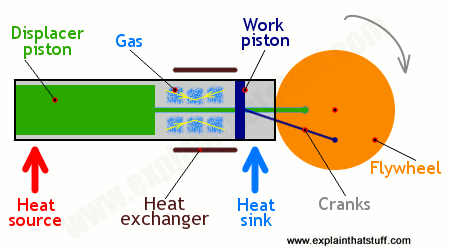 In a different design, shown here, called a displacement (or beta) Stirling engine, there's one completely internal, piston called a displacer (colored green) whose job is to move the gas between the heat source and the heat sink. Unlike a normal piston in a steam engine, the displacer fits very loosely (with a little room to spare between the edge of the piston and the wall of the cylinder) and the gas flows around the outside of it as it moves back and forth. There's also a working piston (colored dark blue), which fits tightly into the cylinder, and turns the expansion of the gas into useful work that drives whatever the engine is powering. In bigger Stirling engines, the work piston usually has a heavy flywheel attached to build up momentum and keep the machine operating smoothly. The work piston and the displacer piston are both constantly moving, but they are out of step (one quarter cycle or 90° out of phase) with one another; they're powered by the same wheel but the displacer piston is always one quarter cycle (90°) ahead of the work piston. Also known as the regenerator, the heat exchanger sits in the closed chamber between the heat source and the heat sink. As the hot gas moves past the regenerator, it gives up some of its heat, which the regenerator holds onto. When the gas moves back, it picks up this heat again. Without the regenerator, this heat would be lost to the atmosphere and wasted. The heat exchanger greatly improves the efficiency and power of the engine. Some Stirling engines have multiple heat exchangers. Like a steam engine or an internal combustion car engine, a Stirling engine converts heat energy to mechanical energy (work) by repeating a series of basic operations, known as its cycle. Let's consider a simplified displacer-type Stirling engine. It's actually quite confusing and hard to figure out until you realize that what's happening is that the gas inside is alternately expanding and contracting and, in between, moving from the hot side of the cylinder to the cool side and back again. The dark blue work piston's job is to use energy from the expansion of the gas to drive the machine the engine is powering, then compress the gas so the cycle can repeat. The green displacer piston's job is to shuttle the gas from the hot side of the cylinder (on the left) to the cold side (on the right) and back. Working as a team, the two pistons ensure that heat energy is repeatedly being moved from the source to the sink and converted into useful mechanical work. Cooling and compression: Most of the gas (shown by the blue squares) is over on the right at the cooler end of the cylinder. As it cools and contracts, giving up some of its heat, which is removed by the heat sink, both pistons move inward (toward the center). Transfer and regeneration: The displacer piston moves to the right and the cooled gas moves around it to the hotter part of the cylinder on the left. The volume of the gas remains constant as it passes back through the regenerator (heat exchanger) to pick up some of the heat it previously deposited. Heating and expansion: Most of the gas (shown by the red squares) is now on the left in the hot end of the cylinder. It's heated by the fire (or other heat source) so its pressure rises and it expands, absorbing energy. As the gas expands, it pushes the work piston to the right, which drives the flywheel and whatever the engine is powering. In this part of the cycle, the engine converts heat energy into mechanical energy (and does work). Transfer and cooling: The displacer piston moves to the left and the hot gas moves around it to the cooler part of the cylinder on the right. The volume of the gas remains constant as it passes through the regenerator (heat exchanger), giving up some of its energy on the way. The cycle is now complete and ready to repeat itself. Although the engine goes through a cycle, ending up back where it started, it's not a symmetrical process: energy is constantly removed from the source and deposited at the sink. That happens because the hot gas does a certain amount of work on the work piston when it expands, but the piston does less work compressing the cooled gas and returning it to the start. Now you might be thinking: "This is all very elaborate! Why mess around with two pistons when a simple steam engine can get by with just one? Why all these separate stages? Why not make the whole thing simpler?" To answer those questions properly, you need to understand the theory of engines: that an efficient engine moves a gas through a cycle of processes according to the gas laws (the basic laws of classical physics that describe how a gas's pressure, volume, and temperature are related). The best known, idealized cycle is called the Carnot cycle and involves repeating a cycle of isothermal (constant temperature) and adiabatic (heat-conserved) expansion, followed by isothermal and adiabatic compression. Isothermal (constant temperature) compression: Our stage (1) above, where the volume of the gas decreases and the pressure increases as it gives up heat to the sink. Isovolumetric (constant volume) heating: Our stage (2) above, in which the volume of the gas remains constant as it passes back through the regenerator and regains some of its previous heat. Isothermal (constant temperature) expansion: Our stage (3) above, in which the gas absorbs energy from the source, its volume increases and its pressure decreases, while the temperature remains constant. Isovolumetric (constant volume) cooling: Our stage (4) above, in which the volume of the gas remains constant as it transfers through the regenerator and cools. A real Stirling engine operates through a more complex, less ideal version of this cycle, which is beyond the scope of this article. It's enough simply to note that the four stages aren't rigidly separated but do blend into one another. 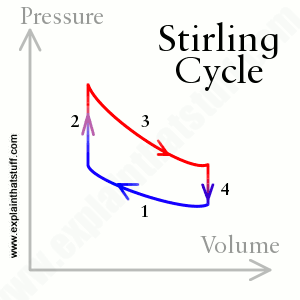 If you're interested, there's much more about this in Wikipedia's article on the Stirling cycle. Wikipedia has another animation of a beta-type Stirling engine (though beautifully drawn, it's hard to follow because the individual stages aren't explained alongside). MIT also has a nice little animation, but the accompanying explanation is fairly minimal. Best of the bunch: There's an excellent animation and explanation at Animated Engines, a superb website with many clear, easy-to-follow pages about all kinds of other engines that's well worth exploring. I love the way that all the engines are drawn in a similar, simple style so you can easily compare them. What can Stirling engines be used for? 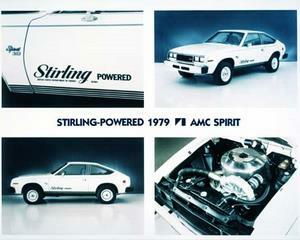 Photo: Although engineers have tried powering cars with Stirling engines, the experiments weren't that successful. It takes time for a Stirling engine to build up speed and it doesn't handle stopping and starting that well, which makes it less suitable for powering a car than an ordinary internal combustion engine. We're unlikely to see any more progress on this front: future cars are more likely to be powered by electric motors or fuel cells. Photo courtesy of NASA Glenn Research Center. Stirling engines work best in machines that need to produce power continuously using the difference between something hot and something cold. They're ideal for solar power plants, where the Sun's heat plays on a mirror that acts as the heat source, and high-efficiency combined heat and power (CHP) plants that need to produce steady supplies of electricity. Recently, Segway pioneer Dean Kamen has helped to rekindle interest in Stirling engines by using them as the basis for a compact, home electricity generator, called Beacon 10, roughly the size of a domestic washing machine. In a normal Stirling engine, you put heat in at the hot end of the machine (the heat source) and get mechanical work and less heat out of the other, cooler end (the heat sink). Just as electric motors can be used in reverse as generators, so you can put energy into a Stirling engine and run it backward, effectively removing heat from the heat sink and expelling it at the source. That turns a Stirling engine into a "cryocooler"—a very efficient cooling device. 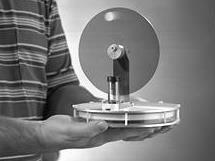 Stirling-engine coolers are used in superconductivity and electronic research. The biggest advantage of Stirling engines is that they're much more efficient than steam engines (largely because of the closed cycle and regenerative heat exchanger). They don't have boilers that can explode, don't need supplies of water, and don't have the complex system of opening and closing valves that steam engines require. That's one reason why they're much quieter than steam engines and, because they don't necessarily involve burning fuel, can be much cleaner. Unlike steam engines, which typically burn coal to boil water, Stirling engines can run from all kinds of different fuels. On the down side, Stirling engines don't start instantly (it takes time for the all-important heat exchanger to warm up and the flywheel to run up to speed) and they don't work so well in stop-start operation (unlike internal combustion engines). They also need large radiators that can expel waste heat, which makes them unsuitable for some applications. It comes as no surprise to find that Stirling engines were invented by a Scottish clergyman named Robert Stirling, in 1816. He'd hoped to make an engine that was safer and more efficient than the steam engines that had been developed about a century before by Thomas Newcomen (and later improved by James Watt and others). The rise of internal-combustion (gasoline and diesel engines) saw Stirling engines sidelined, though they were rediscovered by the Philips company in the mid-20th century. More recently, they've become popular in solar power plants and other forms of renewable energy, where their higher efficiency is prized. The technology gained another boost in the 1980s when Ivo Kolin of the University of Zagreb and James Senft of the University of Wisconsin developed a new, very compact design of Stirling engine, which can produce power with only small differences between the heat source and sink. MM-5 Coffee Cup Stirling Engine: A simple demonstration of a compact Stirling engine from American Stirling Company. This is the sort of engine you can run with cups of coffee or ice cubes. Stirling Engine FAQ: Some very useful background information, also from the American Stirling Company. Dean Kamen Thinks His New Stirling Engine Will Get You Off The Grid For Under $10K by Christopher Helman. Forbes, July 2, 2014. A quick introduction to Kamen's Beacon 10 generator. New Nuclear Engine Could Power Deep-Space Exploration by Adam Mann. Wired, November 27, 2012. NASA explores a nuclear-powered Stirling engine that could power space probes in places where sunlight (and solar power) is unavailable. Ford Motors Is Testing Potential Engine of Future by Richard Witkin. The New York Times, November 3, 1975. A report from the Times archive on Ford's early tests of Stirling engines. Empire Off The Grid by Sally Adee. IEEE Spectrum, July 31, 2009. How Stirling engines and renewable technologies are helping Dean Kamen to live off-grid on his own private island. Mechanical Efficiency of Heat Engines by James R. Senft. Cambridge University Press, 2007. A detailed thermodynamic study of heat engines, including Stirling engines. Stirling and Hot Air Engines: Designing and Building Experimental Model Stirling Engines by Roy Darlington and Keith Strong. The Crowood Press, 2005. A hands-on guide to Stirling engines for model builders. An Introduction to Stirling Engines by James R. Senft. Moriya Press, 1993. A short explanation of the theory by one of the pioneers of modern engines. Engines: An Introduction by John Leask Lumley. Cambridge University Press, 1999. Although this focuses on internal combustion engines, it will be of interest if you're looking for a thermodynamic approach to analyzing engines. Thermodynamics for Dummies by Mike Pauken. John Wiley & Sons. A simple introduction to the theory of thermodynamics and its practical applications to things like engines. Stirling engine example: A 2-minute demonstration of a real beta-type Stirling engine like the one in my animation up above. Stirling engine: taking one apart: Dan Rojas dismantles a Stirling engine and shows you the various bits inside. This video makes even more sense once you understand the theory of Stirling engines.